Analyze yourself, how do you compare with the description of the good tree? ROOTS (EMAAN): I do have emaan but sometimes my actions and tongue do not manifest this emaan. The roots of a date palm tree are thick and firm and run 4-10 meters into the ground. Considering my actions and speech, the root of my tree would not be thick and firm enough and would run 2-5 metres in the ground. FRUITS (BELIEVER PROVIDES KHAIR): A believer like the date palm tree provides khair ALL the time. Not just at a particular time, when he or she is happy and when others do good to him or her. I do provide khair but unfortunately not ALL the time. I’ll be nice to someone if they’re nice to me. The moment someone does wrong to me , it becomes hard for me to do good. Like a date palm tree provides fruits in even the harshest of seasons, I should be one who provides khair to others even in the toughest of times and especially when its hard to. Considering the amount of khair I do provide, my date palm tree would have probably 1/3rd dates an average date palm tree would have. 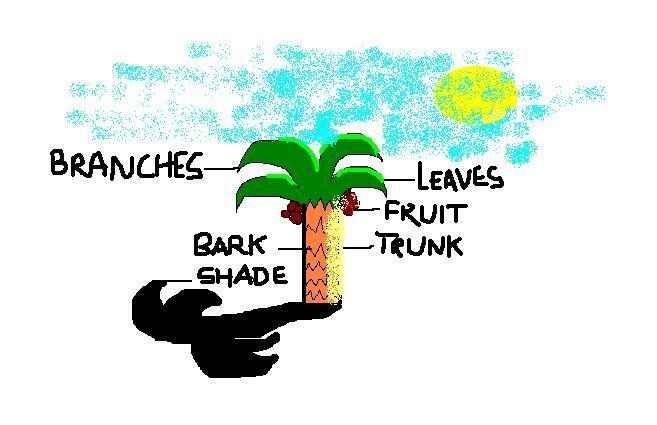 BRANCHES (GOOD DEEDS) : A believers good deeds like the date palm tree, grow upward . My deeds are not really increasing and I think there’s a lot more I need to do. I need to fast more often, make more dkhir, rush towards more acts of khair. My tree would have branches that are not so upright and not growing high to the sky. ALL PARTS ARE UTILIZED : Similarly a believer uses all his skills to benefit others. I’m lacking this. I feel I haven’t really done much to benefit others. I haven’t really spread the ilm I’ve received. I do try to help out others. CAN SURVIVE IN THE HARSHEST OF CLIMATES + EVERGREEN TREE: Similarly a believer does khair at all time. I do acts of khair in both good and bad times. My acts of khair are more at bad times than in times of ease. Unlike the date palm tree, I am not evergreen through out the year. DATES ENERGIZES OTHERS: Similarly a person feeling low gets comfort in the company of a believer. Alhamdulillah I do try my best to provide comfort for those around me. In this aspect I would be similar to the date palm tree. BRANCHES BEND TOWARDS THE EARTH : Similarly a believer is always humble. I am humble and try to constantly remind myself that I am no superior to anyone. There are rare times when I may not be humble. DATES ARE ALWAYS SWEET: Similarly one can always expect good from a believer. I think one can expect good from me only when I’m in a good mood. SOURCE OF JOY : I don’t really think I’m a source of joy to those who see me, besides maybe my family and relatives. At first glance my date palm tree may seem like the average date tree but if you analyze it you’ll find out that its roots are not thick and firm enough , it doesn’t give abundance of dates and the branches don’t grow high in the sky. Besides the fruits not much of it could be utilized. It would be able to survive in the harshest of weathers but would not really be an evergreen tree. It would provide sweet dates to people mostly when the weather is good. The branches would bend towards the ground and upon seeing this tree there may be a source of joy for those who feel like they have a close bond towards it. Others may just pass by it , unnoticed. After having analyzed myself , I feel awful that I am not like the date palm tree but I find assurance in the fact that I can still TRY to be like one. However I should try to become like it really fast before a storm comes and destroys it completely , before its too late. A date palm tree grows vertically, and its roots are planted firmly. Similarly a believer has their feet grounded firmly in knowledge, for only then can they perform deeds that are ‘ahsan’. If the roots of the tree are weak, then the sustenance will not reach all the way up to the end of the branches, and the fruit will not good to eat. Similarly, if the roots of ‘iman’ and ‘ilm’ are weak, then great heights cannot be reached, nor can the deeds that result from faulty knowledge be beneficial. Alhamdulillah, I believe my faith is firmly grounded, but I know that my knowledge is deficient. However there are ways to rectify this and I hope Allah will reveal them to me when the time is right, like He SWT brought me to this class. I am beginning to understand, however, that this dunya is for me, I am not for this duniya. A believer takes their sustenance from the earth, like the tree, but remains focused on the higher calling of deen. Every part of the date tree is beneficial. The bark is used to write on, to make baskets, mats etc ,the trunk is used for making huts, the fruit is eaten, and the fruit and stone can be used for medicinal purposes, in cosmetic soaps, burnt to make charcoal for silversmiths, beaded etc (Wikipedia). In this way, the believer brings benefit to everyone through every action. While I try my best, I certainly do not bring about good for people through every single action . There are many things I do selfishly for myself, to please myself. I can be more proactive and use my time in better ways, such as doing more community work etc. I have a few things in mind that I can do and I hope Insha’Allah this weekend I will get the opportunity to finally do them. The pit or stone of the tree is planted, and so emerges another beneficial, pure tree. These are like the children of the good believers. I hope that Insha’Allah when I have children I will be able to instill in them good Islamic values. The branches bend towards the earth, even though the tree grows towards the sky. While I am trying to gain knowledge of deen and remain focused, I do sometimes tend to think of myself as better then other because of it. I realize how awful this is and I seek refuge with Allah when I do, and I remind myself of how insignificant I am, and how small are my sacrifices in before those who have truly sacrificed for deen. It is a favor of Allah and he can take it away. And it maybe that those I look down upon are closer to Him than me. I also try to humble myself before people, and spending time with those who have less than you definitely helps one become humble. Practical ways to humble oneself also include always being the first to say salaam, even if the other person is younger or lower in social status than you, shaking their hand, standing together in salah etc., as it reminds one that we are all equal before Allah. The good tree thrives in harsh climate. I cannot think of a difficulty that has come upon me as mostly I have been supported in my endeavors by those around me Alhamdulillah. But I ask Allah SWT to keep me prepared for any opposition, so that I am able to argue in the best manner and convince the other person. If I am ever met with opposition, I hope that it will only strengthen my resolve. All good deeds, however boost one’s iman and conviction, as well as other people’ s iman, just like the date energizes the one who eats it.